Your custom pool is designed and ready to go – now the fun begins. Bring atmosphere and attitude to your swimming pool using the perfect accessories. These finishing touches are your chance to personalize your pool and bring character and charm to the finished design. Here at Pool Builders Inc., we’ve completed over 20,000 swimming pools across South Florida and the Fort Lauderdale area. No two pools have been the same, thanks to our innovative and custom approach to creation. To help your design stand out from the crowd, we offer a wide selection of accessories and water features to delight your family and mesmerize visitors. LED Swimming Pool Lights: Alter the mood of your pool at the touch of a button. We offer energy efficient lights that have a wide spectrum of colors to conjure up romance, relaxation or groove to your outdoor space. Water Features: Artistry and imagination – that’s what water features bring to any home. We can help you make a statement and draw the eye with captivating pool elements. Fire Elements: Add a touch of drama to your pool with dazzling fire elements, installed by our experts. 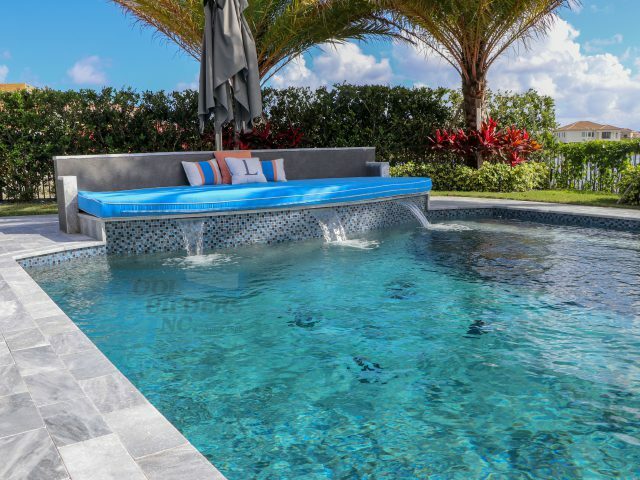 Sunledges: Enjoy your pool in style with beautifully crafted sunledges, which can be seamlessly incorporated into your design. Get in touch to enquire further about our full range of accessories – our friendly advisors are ready to help.